This video shows Mei-Kuei Feu and her "Ambulant Bonsai" performance in Zhuwei and Tapei, Taiwan. Embodying a mobile and upside-down Ginkgo bonsai, multidisciplinary artist Mei-Kuei Feu presented her public art project for the first time in various neighborhoods of New York City in 2008. Fascinated by its beauty and its amazing history, the artist works with the Ginkgo’s fan shaped leaves as a medium for conveying printed images which reflect tragedies of the last century and the passion of present day life. 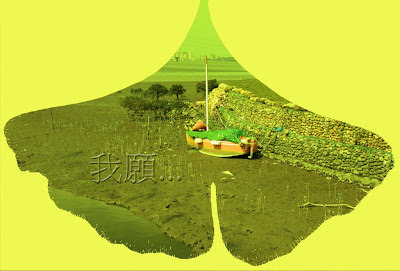 Through a process of exchange, the public are invited to write their wishes for life on a photo shaped like a Ginkgo leaf, and in return, receive a real Ginkgo leaf stamped with "Ginkgo messenger". The Ginkgo Messenger project is born from a series of research work on a dialogue between humans and house plants. Linking the internal environment of our body and the external natural environment, the artist wishes to create a garden that is both intimate and public.